* Home-grown principles of flower garden design explained here. The most essential flower garden design guidelines are introduced on this page. You’ll also find side panel links > to additional information on specialised gardening methods, including patio gardens, organic flower garden style, plus ten themes for your flower borders. Knowing the growing needs of disirable plants is vital for success too - a page on this is coming soon. But start right here to improve and develop your flower garden designs. A lifetime of keen observation and practical experience has inspired these 15 methods. Use them as guidelines to your unique garden challenge and your task will be simplified. They will help you avoid mistakes and improve your flower garden design. You are welcome to add your own design ideas and comments at the end of this page. Creative flower garden design requires a sense of natural proportion, shape, style and color-blend as well as planting know-how. Modern efforts to garden with junk: bottles, drain pipes, murals... may be perculiar art, but they are not gardening. Yet when you are looking for a new flower garden design, three things can bewilder:- the need to fill a blank space - restrictions imposed by an existing garden - and horticultural convention. So free your spirit, take a fresh look, and learn from the following. Top priority - you need to establish a unifying look and feel for your garden. So be inspired by the shapes and textures of plants or try to capture the essence of a favourite natural landscape such as wood, scrub, meadow, bog, mountains... ... Harmony abounds in nature. What are your favourite shapes and textures? Below, you'll find 10 ideas for flower garden designs that illustrate unifying themes. They are merely examples, so do check through all the headings below, to get a fuller grasp of garden design possibilities. Choose plants and materials that embody the characteristics of your chosen theme. Then do repeat planting to	emphasise. Provides clear wide spaces around top class horticultural specimens so they can grow to their fullest potential. 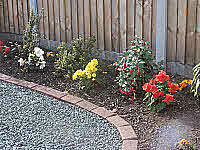 Your garden could have many different elements:- paths, seats, mounds, slopes, steps, pergola's, lawns, borders, hedges... These all need to work in harmony so they belong to each other. Consider how these individual elements can reinforce the look and feel of your prevailing theme. Do avoid anything that is discordant. My main interest is in getting the planting right. But let's start with an illustration of unifying hard landscape materials. Consider a choice between stone blocks or logs, stone chippings or wood chippings; what about seats of timber, iron work, or rope...? Most designers would agree that rope and timber work well together - their fibres seem natural. But will earthy rough logs blend well with machined and varnished wood, or with a top quality fine lawn, or with enamel painted iron work? Manufactured finishes - from finely clipped topiary hedging to ornate iron work - can blend together. But these artificially refined features don't blend so well with those in their natural state. Long grass or meadow is not so well seen near to modern garden furniture made of metal or polished wood for example. When choosing plants do consider how their shape, size, structure, texture, shade and colour contribute to the overall qualities you require. All these properties influence the look and feel of your garden. They give you reference points to objectively assess how plants will blend into your theme. You will be on the look out for plants that fit with your chosen style of garden. Let’s illustrate a few examples of gardening themes that you could use. Scroll down to find Eleven Unifying Garden Themes - Formal to Informal >> - OR read on for the essential background to flower garden design. Whatever your theme, it should be consistent within each planting area. This decision will help you choose the most suitable looking plants and accompanying features. Then, emphasise your chosen style over and over again. You will choose plants that embody the look and feel of your flower garden design. Plant them in groups to fill the areas between feature plants. Repeat plant as many times as possible. This will emphasise your chosen theme. I suggest that you keep contrasting forms in seperate blocks. Do avoid weak and lonely, straggler plants. The shape and texture of plants is perhaps more important than their flowers. Flowers are often short lived and cannot influence the look and feel of the garden in a lasting way. So it is the permanent shapes and textures of leaves and branches that contribute most to the look and feel. Consider how these characteristics will blend together. Globe headed flowers, rounded shrubs and large round leaves complement curved spaces. Upright shrubs, flowering spikes and sword shaped leaves complement straight edges. You should also consider this when blending plants together. Look from left to right and front to back. Which direction draws most attention? Is there a focal point? To avoid equal symmetry divide space into thirds. 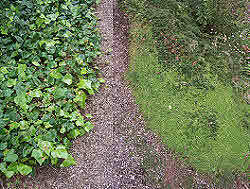 You might for example, balance a more tall narrow planting opposite a high and wide area with low planting between them. Equally a tall planting can balance two wide areas around it. Positioning a fine lawn down one side only, somehow, demotes the lawn from an attraction to a mere utility. Colorful flowers may grab attention, but don't overlook the value of a restful lawn in your design. Indeed the green uniformity of the lawn sets off your bright flowers. You might describe it as a foil. However, wood chip and aggregate are overused for this purpose nowadays and the latter makes gardens sterile, cold and uninteresting. 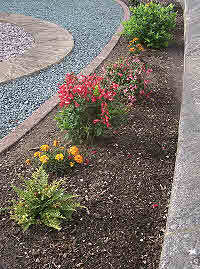 Try low spreading plants instead to give rest and calm within a flower or shrub border. Have you seen those tight knit, fine textured and rounded shrubs, such as Hebes or ground hugging Junipers? They too can provide a restful foil and solid structure between actively growing and merry looking groups of flowers. A fine texture is created by well-branched plants with small leaves. The opposite occurs with large open branching plants that carry big bold leaves. Small spaces will seem overcrowded by large plants. But small fine textured plants can be grown in numbers to provide a uniform spacious background. As individuals however, they are lost between the large course textured plants. Take an example of scale in the hard landscape. Consider the visual affect of pea sized gravel compared to large pebbles. The course texture looks nearer, the fine texture adds Depth and Space. Nearby elements of your garden need to be of a similar scale so as to blend together, or of a different scale to provide contrast and relief. A mass of same plants can look like a two dimensional barrier or monotone block. Try to open out the garden and lead the eye through to focal points beyond. Create false horizons to diminish the impact of fences and hedges. In nature, fine fuzzy textures, muted grey or light pastel shades, make up the distant view. The foreground is always bright, sharp and bold. Imagine the impression of depth created by placing bright course textured plants in front of fine texture plants, for example. Yet the order and distance of these different qualities is perhaps less important than their placing in a contrasting juxtaposition (i.e. apparent proximity) that emphasises these different qualities. Be careful that contrasting features are not actually clashing features. Pick out a minor shade in your background or foreground colour-mix, for the major shade of a bold contrasting feature. Use fine textured evergreen shrubs to form a permanent structure to your garden. This lasts through the winter. Try dwarf or tightly clipped plants of: Conifers, Hebes, Azaleas, Box, Hedera, Hypericum, Berberis... and others. Some shrubs flower in spring before perennials and then berry and change color in the fall. Shrubs can turn a seasonal garden into one that feels warm and friendly all year. With this approach you will have a garden that changes slowly, and although it may look more lively in summer it never really dies away. By moving your garden away from the showcase or decorative approach (described here) you can have a garden with year around interest. With your knowledge and love of plants you can focus on the interesting and remarkable, rather than on the popular, commonplace, perfect or dazzling. From early flowering bulbs to ornate seed heads and rich fall colour, your plants are amazing. Especially important for success in organic gardening is the natural provision of resources for wild animals like bees, humming birds, bats, hedgehogs and so on. Look after 'mother nature' and she rewards you by looking after your organic garden. And you'll get your share of the fruit and herb pickings too. You have to plan your garden in time as well as in space. Consider your plants annual growth cycle. Will your flowers compete with each other all at one time, or will they come into flower in sequence? How will they blend together at any particular time? Stretch your flower garden design ideas to the seasons and years ahead. The change from early low growth to robust plants can create an exciting dynamic landscape. But there has to be enough room for growth. I don't favour the extensive use of aggregate and wood chip that make so many gardens look sterile and uninteresing. But a young garden may begin with small saplings. Later these will become significant trees, hedges, and shrubs that take up considerable space and cast significant shade. Individual perennial plants may become sizeable clumps. So in the early years the space left for growth could be planted temporarily with annuals or small perennials. But later these will have to be replaced or downsized. Try to ensure that your plants always remain in harmony and balanced over time. Pure landscape design is rarely possible in domestic gardens. Many other considerations can take priority over the purely aesthetic flower garden designs. They include the need for privacy, security, access, and specialised constructions for growing your favourite fruit and vegetables. Screening can look natural with the help of dense hedges, trellis work and climbing plants. However, tall screens on the sunny side of the garden can be a major limitation to growing some nice plants. Thorn hedges and groups of thorny shrubs are a significant deterrant. Crunchy gravel or shells also deter intruders, but is it necessary to fill large areas with these relatively uninteresting materials? Flower garden designs for accessing your plants include brick or block paths, stepping stones, erosion resistant matting sown with lawn seed, as well as the usual gravel, concrete, and tough utility lawn paths. For the flower garden, Chamomile will give you a unique scented path that's lovely to walk on and to mow - although it hardly needs mowing. Raised beds are especially useful for disabled people. They help to bring the garden within reach. The materials that are used to construct raised beds can also be used for terracing sloping ground or for building tiered water features. You'll find much more about raised bed gardening on this link. Very Brief Summary For Creating Your Flower Garden Design - see details above. Tell us about your own flower garden design ideas and garden plans? Would you like to send me pictures of your flower garden designs? Share your pictures with visitors to the-organic-gardener.com? I want my visitors to read about Your flower garden ideas and how you manage your flower garden. There are many styles of flower gardening - what is your favourite? There are many gardening challenges to contend with - how do you grow your flowers? I'll do my best to answer any queries that you include but then please include all relevant details about your garden and plants. Whatever your story is, we all have lots to learn from gardeners like you. So please make your story around 300 words or more. You can also upload up to 4 pictures of your flowering plants, flower garden and, why not include one of you. I look foward to reading your story and viewing your pictures. Your story will appear on a Web page exactly the way you enter it here. You can wrap a word in square brackets to make it appear bold. For example [my flower garden] would show as my flower garden on the Web page containing your story. So click the button and find the first one on your computer. Select it and click on the button to choose it. Then click on the link if you want to upload up to 3 more images. I can't wait to see your pictures.